Dublin-based Boulder Media are best known for their work producing animated shows for big names in the US and UK, most recently the brilliant relaunch of Danger Mouse. When not working for majors like Cartoon Network and the BBC they also aim to produce their own original content, whenever they can. 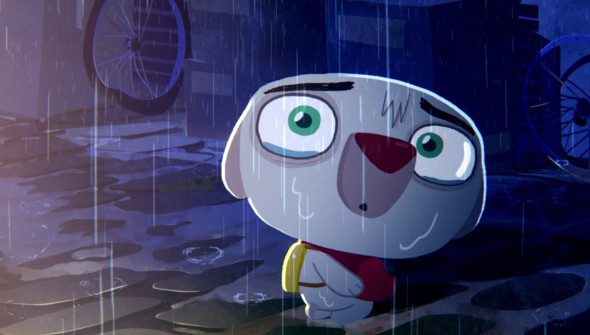 Their 2014 original short Fresh Cut Grass has become a favourite with festivals all over the world, winning acclaim at film and animation festivals both at home and abroad. Most recently it played the Manchester Animation Festival in the UK and went down a storm. Up until now if you wanted to see it for yourself, your only chance was at such an event. Luckily, however, it has now been released online for all to see. Written and directed by Rob Cullen (director on the 2015 Danger Mouse) this is a must watch. It's a beautifully animated story of a young dog who travels to the big city to see his beloved sister. It starts out as a cute and charming story, like a short you might see play in front of a Pixar or Disney movie. However, it quickly takes a turn as the puppy discovers the city life isn't all it's cracked up to be. It goes to some dark and unexpected places that you wouldn't be anticipating from the opening. The very last movie you'd expect to be reminded of here is Liam Neeson vehicle Taken. Such tonal shifts are risky, but Cullen pulls it off in a way that seems deceptively effortless. We should point out though that although it gets darker, that doesn't mean that it's overly serious or bleak. Even when it's depicting the city's seedy underbelly, it's still often very funny. Hopefully, the success of projects like Danger Mouse will help fund more original work like this. As our first taste of Boulder working for themselves we are very impressed, and can't wait to see more. Watch the full short below. Fresh Cut Grass from Boulder Media on Vimeo.